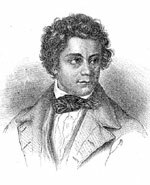 Julius Mosen was born in July 1803 in Oldenburg and studied at the University of Jena where he came to the notice of Goethe. His work took him to Leipzig and then Dresden where he became known as a lawyer with liberal leanings who combined his legal work with literature. His Gedichte were published in 1836 by Brockhaus of Leipzig; Schumann found Der Nussbaum on page 122 of that edition. It is possible that the composer had encountered Mosen personally. Mosen had a highly successful career as a playwright but his Schiller-influenced historical dramas (as well as his poems which seem, on the whole, exceedingly unoriginal) are not worthy of revival (he was also well known in his time as a producer of plays). His novel Der Congress von Verona, on the other hand, is a witty and perceptive piece of political writing, and his memoirs (Erinnerungen, published in 1893) are an atmospheric evocation of his times. Mosen died a reasonably famous man in 1867 but he is now almost completely forgotten. Although Schumann set only one solo song by Julius Mosen there are two other settings for male chorus TTBB (Der träumende See Op 33 No 1 and Der Zecher als Doktrinär Op 33 No 4) both of which date from 1840. There are also settings of Mosen by Peter Cornelius (the duet Brennende Liebe Op 16 No 2) and by the American Charles Griffes.